On Tuesday, Jan. 15, San Luis Obispo High School is buzzing with students getting from first period to second. After students reach their destinations, campus is silent except for the light rain hitting the pavement. Fifteen minutes into the class period, an announcement comes over the public address system: "We are currently in a drill, only a drill." The heavy thud of classroom doors closing, one after another, is the only sound. PATROLLING FOR SAFETY SLO High School Principal Leslie O'Connor walks the halls of campus during a lockdown drill in January to ensure that teachers and students are following protocol. Nick Frost, the assistant principal who orchestrated the lockdown drill, designated a group of teachers, administrators, and faculty to check every classroom to ensure everyone is following lockdown protocol. 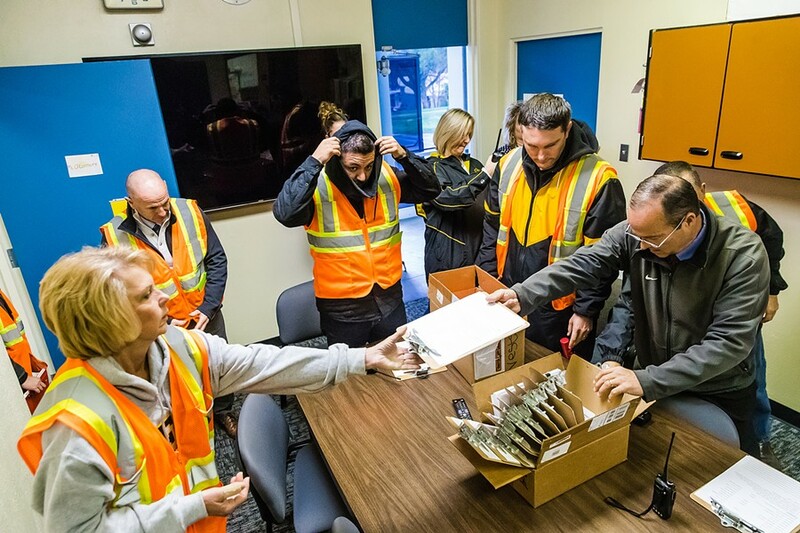 Donning bright orange vests, each person has an assigned area of the campus to check: Is the door locked? Are the lights turned off? Are students away from the windows and doors? SLO High Principal Leslie O'Connor pulls on door handles, looks through windows, and bangs on windows in his assigned area. Sometimes, he tells the class on the other side of the door to open it for him. If they willingly open the door, they fail. If he can see students through the window, it's a fail. If the door is unlocked, fail. If an active shooter ever does come to campus and a classroom fails to implement any of the lockdown protocols, students and the teacher could be in danger. "You get to a corner of the classroom where there is no glass, you would get to a space where you could turn off the lights, diminish cellphone usage, and we tell [students] to be very still and very quiet," O'Connor says. "If they're outside, get inside somewhere safe quickly or run as quickly as possible off campus." Nationally, an active shooter incident on a school campus is rare, although there has been an increase of incidents over the last few years. According to a Jan. 24 report from the Centers for Disease Control and Prevention, between 1994 and 2018, there were 38 active shooter incidents that resulted in fatalities. Of the 38 incidences, five occurred during the 2017-18 academic school year and three were in the 2016-17 school year. Lockdown drills are a common way for schools across the country to prepare for the worst. On the Central Coast, schools and law enforcement officials are working together to understand the changing reality of safety guidelines in the event of an active shooter. A new phone app and proactive thinking are some of the ways that these entities are working together to ensure student safety. 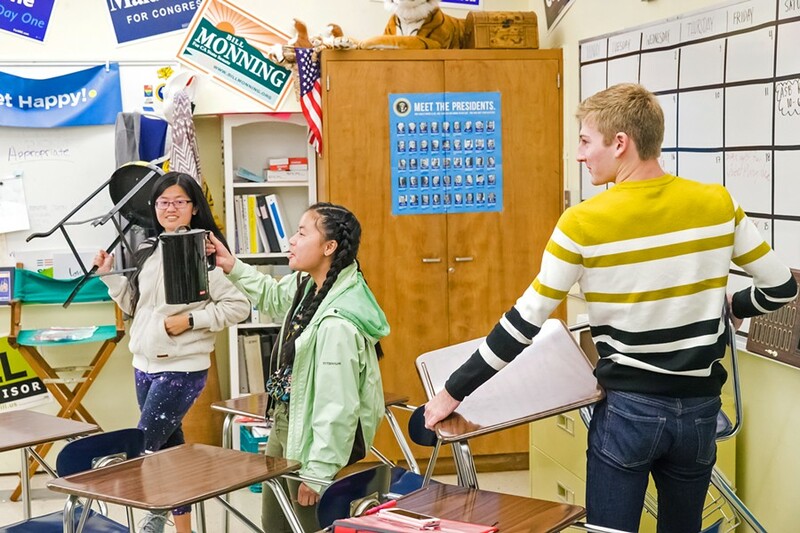 In the back of everyone's mind, aside from "it could happen here," is that news of such incidents has left a greater impression on their lives than any other type of school emergency they prepare for—namely earthquakes and fires. Before the drill takes place on Tuesday morning, O'Connor sits at a table in his office that faces a wall made out of windows. He can see every student who walks by his office, which is at the center of campus in the administration building. He's been in the education field for 27 years as a coach, teacher, assistant principal, and principal—all at the high school level. Throughout his career, he says, the possibility of an active shooter coming to campus has been in the back of his mind—even though he feels safe at SLO High. "Columbine was in 1999, and the reason why I reference that is because for anyone that has come into the profession right around that time period, when you're talking about active shooter, that's all they've ever known," he says. 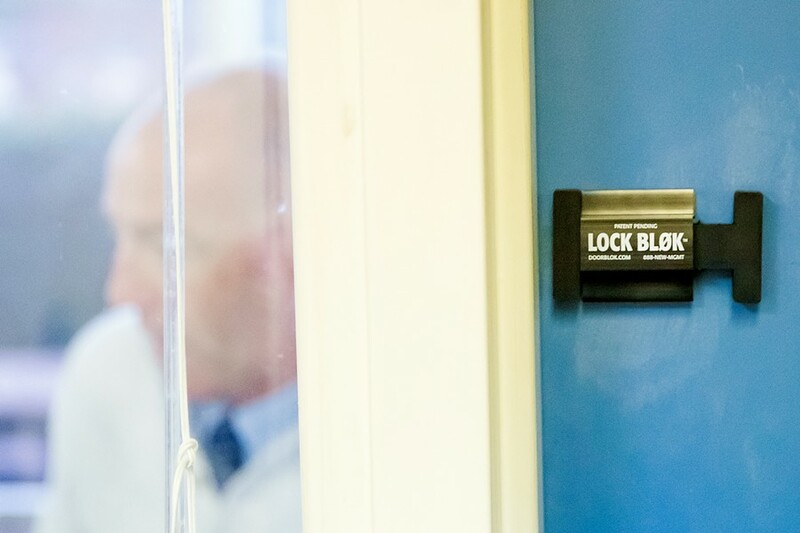 SHUT TIGHT Three years ago, a former educator created the Lock Blok, a tool to lock classroom doors from the inside rather than traditionally locking them from the outside. He's talking about the April 1999 massacre that occurred at Columbine High School in Columbine, Colorado. Two 12th grade students opened fire and murdered 12 students and one teacher, injured 31 people, and took their own lives. Since Columbine, there have been 10 school shootings that claimed more than five lives each—some had more than 30 casualties. April 2007 in Blacksburg, Virginia: A 23-year-old killed 32 students and faculty members at Virginia Tech with semi-automatic pistols, injuring 17 others. December 2012 in Newtown, Connecticut: A 20-year-old killed his mother, 26 people at Sandy Hook Elementary School, and himself, injuring two others. February 2018 in Parkland, Florida: A 19-year-old former student of Marjory Stoneman Douglas High School shot and killed 17 people and injured 17 others. May 2018 in Santa Fe, Texas: a 17-year-old killed 10 people at Santa Fe High School and injured 13 others. There are countless other reported incidents where active shooters on school campuses injured fewer than five people. "Let's say there is someone that has been in the profession for 35 to 40 years. There's that time frame of pre-Columbine when you never thought about an active shooter situation on a school campus," O'Connor says. "If you talk to them now, they're going to say, in terms of student safety, 'Things are totally different.'" Before, he says, schools really prioritized fire and earthquake drills. Now, there's a huge emphasis on lockdown drills, conversations about what to do in the event of an active shooter on campus, and knowing who's on campus at all times. Part of knowing his students are safe, O'Connor says, is by getting to know each and every one of them—literally. "We have almost 1,600 students, so we have 1,600 sets of eyes and ears," he says. "If you see someone who doesn't look like they belong, don't walk by and ignore it, it has to be brought to our attention." Schools were once thought of as a reliably safe and secure environment, but that image has since been shattered by attacks on school campuses by students or intruders. According to the California Governor's Office of Emergency Services (Cal OES), active shooter situations are unpredictable and evolve quickly. First responders are needed to stop the shooting and mitigate danger, but active shooter situations are usually over within 10 to 15 minutes—before law enforcement arrives on the scene. Response time to an active shooter on a school campus is something the San Luis Obispo County Sheriff's Office is hoping to improve with the push of a button. Last year, the office announced the implementation of the RAVE Panic Button app. The phone application alerts local law enforcement of an emergency on a school campus, pinpointing exactly where the emergency is, while simultaneously alerting all administrators, faculty, and teachers on campus (as well as school district officials and personnel in the SLO County Office of Education). ROUND UPS Lockdown drills are taken very seriously at San Luis Obispo High, where designated staff check every classroom for locked doors, hidden students, and lights out. Sheriff Ian Parkinson told New Times that the county is one of the first on the West Coast to have the safety tool in their holsters. With the help of Department of Homeland Security grants, his office purchased 3,200 app licenses, enough for almost every public and charter school in the county. The app has five buttons to choose from in the event of an emergency: active shooter (red), medical (blue cross symbol), fire (flame symbol), 911 (in green blocks), and police (a yellow badge symbol). Districtwide, employees have access to a specific passcode and login in order to download that app and utilize its services. The app is tailored to each school throughout the county as each campus has its own unique layout. The Sheriff's Office contracted with Cal Fire to create a database with geomaps of every school. The maps identify every square inch of each school and highlight access points for local law enforcement. If a teacher were to hear gunshots in the adjacent room, Parkinson said, the teacher can pull out their phone, open the app, and hit the red active shooter button. An alert is sent to everyone on campus with access to the app (prompting a lockdown) and local law enforcement. With the information from the app, law enforcement has the exact location of the reported incident on their mobile computers. "If [law enforcement] is getting told it's happening in the cafeteria, they can look right on the map and see exactly where it is. We can then direct personnel in because we want them to get close, but we don't want them to be right up to it," Parkinson said. The app eliminates the need for school staff to pick up the phone, dial 911, and explain the situation. With the push of a button, the right people are alerted and know which area of campus to respond to. "Between the mapping and the panic button, those were two areas that we felt that we could respond to a situation as quickly as possible and provide safety to students as fast as possible," Parkinson said. Geomapping of the school and the phone app are the most recent steps in a comprehensive plan of student safety that the Sheriff's Office has been working on for three years. The initial steps provided the tools to train law enforcement throughout the county and created a relationship with schools to assist them in their safety procedures. A piece of that effort is having school resource officers on campuses who have various responsibilities—including teaching gang resistance education and training to sixth graders. But above all, those officers are there to ensure student safety. Prior to being a school resource officer, Deputy Paul Muñoz was a patrol officer for more than 10 years. "Having dealt with adults on a daily basis while I was on patrol, I thought, 'You know, maybe we can prevent them from starting or going down that path of a life of crime,'" Muñoz said. "I knew there was a big opportunity for me to make an impact." But the job was a little more challenging than he realized. Getting students to understand that he's there for their safety and that he's not there to keep tabs on them wasn't easy. "I want them to kind of look at me and go, 'Hey, there's Deputy Muñoz. He's here to protect us, but I know I can also go talk to him about any problems that I do have,'" he said. 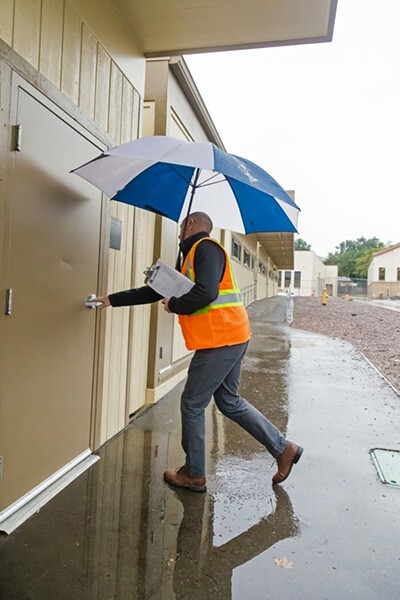 OUT OF SIGHT Knocking on the door, pulling on the handle, and asking for someone to open the door are just a few tactics that SLO High Principal Leslie O'Connor uses to check if classrooms are following lockdown procedures. Muñoz said he's there for students who need to chat about issues with their peers, notify him of a problem they've witnessed on campus, or go over family issues that could be affecting their lives. In order for students to know that they're safe from danger or that he's available to talk, Muñoz makes himself as visible as possible. He's the school resource officer for the Templeton Unified School District—Templeton Elementary School, Vineyard Elementary School, Templeton Middle School, Templeton High School, and Eagle Canyon High School. When students enter campus for the day, he's near the entrance, he's there during their break, lunch, and after school. He hopes it leaves the impression on kids that he's everywhere because he's the one who will respond first in the event of an emergency. "I know my partners are close by, and they'll respond in a heartbeat as well as other agencies," he said. "Sometimes I think, 'Can I run fast enough, do I need a golf cart, or what's the best approach?'" It's a lot of responsibility, Muñoz said, having every single student's safety in mind. And he doesn't take the job lightly. If that worst-case scenario were to happen, he said, he wants to be ready and make sure every student goes home at the end of the day. "One thing I do tell kids is, 'Hey, listen I've been a patrol deputy for over 10 years, and every day I wore my vest.' As you can tell I'm still wearing it now," he said tapping on his vest. When Brent Vander Weide started his career in education, it was around the time of the Columbine High School massacre, something he's never forgotten—but he didn't know that it would affect his career the way it has. He's the student safety and support coordinator for the Lucia Mar Unified School District. "I knew there was potential for it, but did I envision myself being the spokesperson for active shooter response? I never envisioned it coming that far," Vander Weide said. "I never envisioned training teachers how to neutralize a violent threat by force." This is the first year that he and the district rolled out ALICE Training. ALICE stands for alert, lockdown, inform, counter, and evacuate. These instructor-led classes prepare and provide a plan for individuals and organizations about how to more proactively handle the threat of an aggressive intruder or active shooter event. ALICE is different from the conventional lockdown method, which has changed over the last couple of years. Students and teachers are no longer trained to just hunker down under a desk and wait out the situation. Vander Weide said the principles of ALICE are: Do whatever best fits the situation at the time. There's no chronological order or steps that someone needs to follow. "If you hear gunshots, and you know that it's far away and you have an opportunity to evacuate, ALICE is designed to give you that authority to make that move and get yourself to safety," he said. SURVIVAL INSTINCTS Jim Johnson's AP government and politics students were asked what they would use if they had to protect themselves against an active shooter. Vander Weide said in The Sandy Hook Elementary School Shooting a boy decided to run, evacuating the situation, and about seven other kids followed him. That's the whole point of ALICE, he said. The boy had the authority as little kid to make the decision and saved other lives by just taking off. "While we don't necessarily want to train and drill those younger kids, we want our kids, especially the middle school and high school, to understand that here are your options. You have the authority to exercise your options and survive," he said. There are also people within the district who really want to know what to do, who want to be told how to handle a situation. Vander Weide said that he's able to provide those people with recommendations on the best decision to survive, but he's not able to give direct orders. 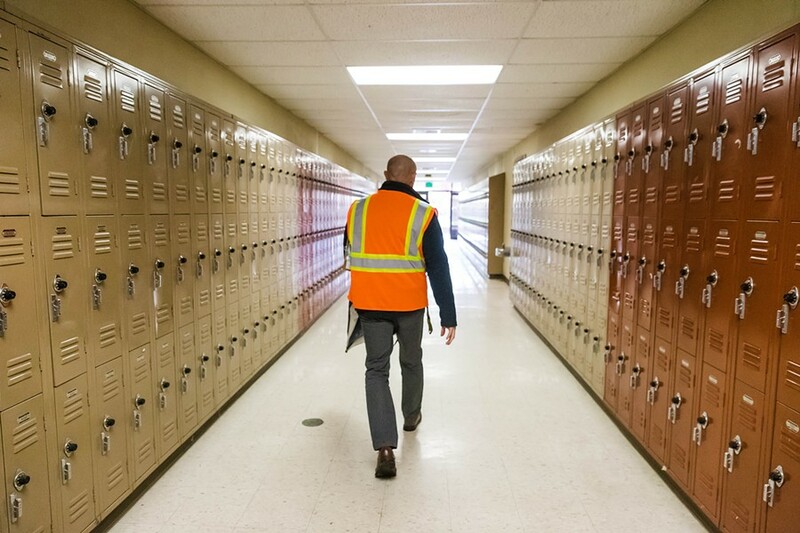 The district changed the name of its emergency drill procedure from "lockdown" to "secure in place," which aligns with the more proactive approach that ALICE teaches. Before, when a lockdown happened, everybody would lock the doors and line up against the wall or get under a desk. Vander Weide said people would just cower. "Basically, you're just sitting there and waiting. What you're creating is a target-rich environment," he said. "The principles of this active shooter response are to be proactive, don't be a sitting target." He said if you're going to run, be a moving target—moving targets are harder to hit—and offer distractions. After the lockdown drill is over at SLO High School, students resume their normal classwork. Jim Johnson's AP government and politics class went right back into the discussion they were having before the drill. Students face the front of the classroom looking at a PowerPoint slide. The class is adorned with campaign posters from the most recent presidential election and the years prior. There's also a poster with all the political parties on it. Students have put stickers on it to show where their allegiance lies. Johnson has created a space for his students to feel comfortable voicing their opinions. Student Leila Silver says that she believes active shooter incidents are a national issue that can be solved at the legislative level. "It's cool that our local police officers and the school is invested in helping us, but real change is going to come from people implementing common sense gun control laws, background checks, etc." Silver says. "There's only so much we can do." Johnson asks his class if they found themselves in an emergency situation and had to exercise self-defense what would they do? He asks his class to look around the room and grab something they would use to arm themselves with. It takes the students less than a minute to grab something. A Hydro Flask, an umbrella, a chair, an entire desk, a knife. The knife isn't a normal object in the classroom. Johnson is also a Associated Student Body advisor so it was one of the kitchen appliances in the classroom leftover from a recent event. The students share different thoughts about a shooter situation. Some say they believe students take advantage of the drills, thinking it would never happen at SLO High. All of the students say that the thought of an active shooter and seeing national coverage of active shooters is scary. But Lili Steel says it's almost normal to think about. "I think, unfortunately, it's reached a point when we think, 'When is it going to happen here?' because you see it happening nationally to kindergarten children, people in college, and high school students," Steel says. "I don't think it should be the thought of a 4-year-old or a 20-year-old." April 1999 Columbine High School, Columbine, Colorado: Two 12th graders killed 12 students and one teacher, injured 31 people, and took their own lives. March 2005 Red Lake Senior High, Red Lake, Minnesota: A 16-year-old student killed four adults and five students. He injured seven others. April 2007 Virginia Tech, Blacksburg, Virginia: A 23-year-old killed 32 students and faculty members and injured 17 others. February 2008 Northern Illinois University, Dekalb, Illinois: A 27-year-old killed five people and injured 21. April 2012 Oikos University, Oakland, California: A 43-year-old killed seven students and wounded three others. December 2012 Sandy Hook Elementary School, Newtown, Connecticut: A 20-year-old killed his mother, 26 people at the school, and himself, injuring two others. June 2013 Santa Monica College, Santa Monica, California: After killing two of his family members, a 23-year-old killed a total of six people and injured four. October 2014 Marysville Pilchuck High School, Marysville, Washington: A 15-year-old shot five students, killing four people including himself. October 2015 Umpqua Community College, Roseburg, Oregon: A 26-year-old student killed eight students, one teacher, and injured nine others. February 2018 Marjory Stoneman Douglas High School, Parkland, Florida: A 19-year-old killed 17 people and injured 17 others.